International freight forwarding and logistics company Panalpina increased its operating result and profit in the first quarter of 2015. Consolidated profit increased 10% to CHF 19.6 million while EBIT increased 3% (adjusted at constant currency rates: +12%) to CHF 25.3 million, helped by a positive quarter in Logistics. Year-on-year, EBIT and conversion rate increased in Ocean Freight as volumes grew by 5% but decreased in Air Freight where volumes only grew slightly by 1%. Group gross profit went down 3% (currency adjusted: +2%) to CHF 371.8 million, while total operating expenses decreased by 4% (adjusted: +2%) year-on-year. Panalpina achieved an EBIT of CHF 25.3 million, an increase of 3% (adjusted: +12%) compared to last year’s first quarter. 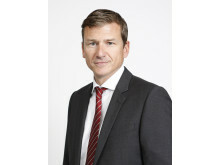 The EBIT-to-gross-profit margin increased to 6.8% – up from 6.4% a year ago. Panalpina’s Air Freight volumes grew 1% in the first quarter, against an estimated market growth of 3 to 4%, mainly caused by lower volumes in the automotive sector. Gross profit per ton decreased 4% to CHF 722 (Q1 2014: CHF 754); as a result, gross profit reached CHF 148.0 million (Q1 2014: CHF 153.7 million). 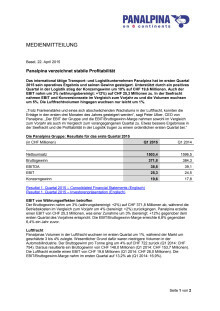 Air Freight achieved an EBIT of CHF 19.6 million (Q1 2014: CHF 26.0 million), and the EBIT-to-gross-profit margin for the first quarter decreased to 13.2% (Q1 2014: 16.9%). Supported by high-volume contracts, Panalpina’s Ocean Freight volumes grew 5% year-on-year – above an estimated market growth of 3%. Gross profit per TEU decreased 8% to CHF 308 (Q1 2014: CHF 333) but was up sequentially (Q4 2014: CHF 297), resulting in a gross profit of CHF 119.1 million (Q1 2014: CHF 122.7 million). 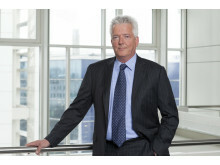 Ocean Freight posted an EBIT of CHF 4.5 million, compared to CHF 3.9 million the year before, and the EBIT-to-gross profit margin increased to 3.8% in the first quarter (Q1 2014: 3.2%). The company’s exit from underperforming sites meant that the gross profit of the Group’s Logistics product decreased 3% to CHF 104.7 million (Q1 2014: CHF 107.8 million), but EBIT turned positive with a profit of CHF 1.2 million for the first quarter of 2015 (Q1 2014: negative EBIT of CHF 5.5 million). 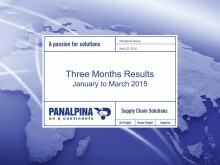 Panalpina hat im ersten Quartal 2015 sein operatives Ergebnis und seinen Gewinn gesteigert. Der Konzerngewinn stieg um 10% auf CHF 19,6 Millionen. Auch der EBIT nahm um 3% (währungsbereinigt: +12%) auf CHF 25,3 Millionen zu. In der Seefracht nahmen EBIT und Konversionsrate im Vergleich zum Vorjahr zu und die Volumen wuchsen um 5%. Die Luftfrachtvolumen hingegen wuchsen nur leicht um 1%.